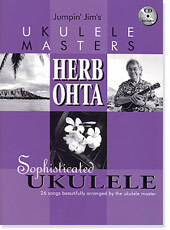 JUMPIN’ JIM’S UKULELE MASTERS: HERB OHTA is a collection of 26 songs beautifully arranged by the great ukulele virtuoso, Herb Ohta (Ohta-San). All songs are arranged for GCEA tuned ukuleles. Also included is a CD of 15 of the arrangements performed by Herb Ohta himself. Featured songs include "Stardust", "Take The "A" Train", "I’ll Be Seeing You", "Sunny" and "Yesterday". In addition, 5 Herb Ohta original songs are included in this book (and on the CD) showcasing the songwriting talent of this great artist.